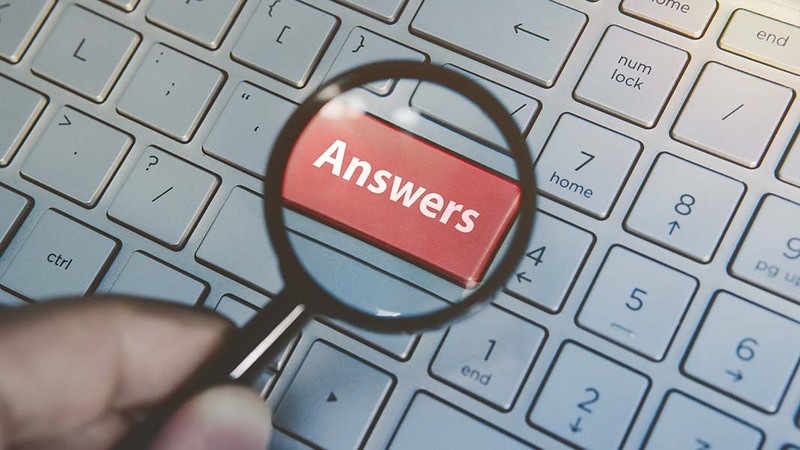 How Google morphing to an Answer Engine affects you. I had a client call a couple weeks ago. She said, “John, I’ve watched our traffic over the last few weeks and it seems to be down.” I asked her if the calls were still coming in. She said, “Oh yes, we’re getting calls, just not as much traffic.” After we hung up, I thought to myself, “It’s happening.” Anyone who follows Google as closely as we do knows that Google is repositioning itself to be an answer engine rather than just a search engine. A search for “calories in chocolate cake” produces what Google believes is the best answer at the top of the search page. Three years ago, you may have owned the nutrition site that people clicked on to get the answer. But not now, your traffic is way down. If you’re a home service professional, there is another development separating you from the top of the searches, Local Service Ads. You may have seen them, they look like this. In the case of home service ads, Google is trying to weed out the pro’s whose reputation is less than sparkling. 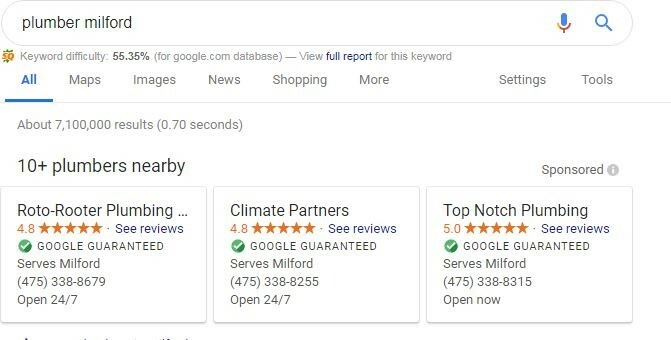 To be Google Guaranteed, like Roto-Rooter above, home service pros must complete a lengthy application that includes a background check (we’ll save more on this for another article). Why is Google changing to an answer engine? Mobile devices and voice search is the short answer. People on the go no longer have the patience to scroll through a search results page. They want the best answer now and they trust Google to deliver it. It won’t be long when websites become obsolete as a place where customers find you in an initial search. Your website will be just one piece of a formula Google will use to deliver the best answer to a user’s inquiry. Your website won’t be completely obsolete of course. It will still be used as an online brochure and standard SEO practices will still apply; you want Google to see your information, onsite and off, before your competitors’. Answer engine optimization (AEO) is similar to SEO. The difference is specificity. When people type a question, brevity is a factor, they ask the question in as few words as possible, “gas fireplace CT” or something like that. 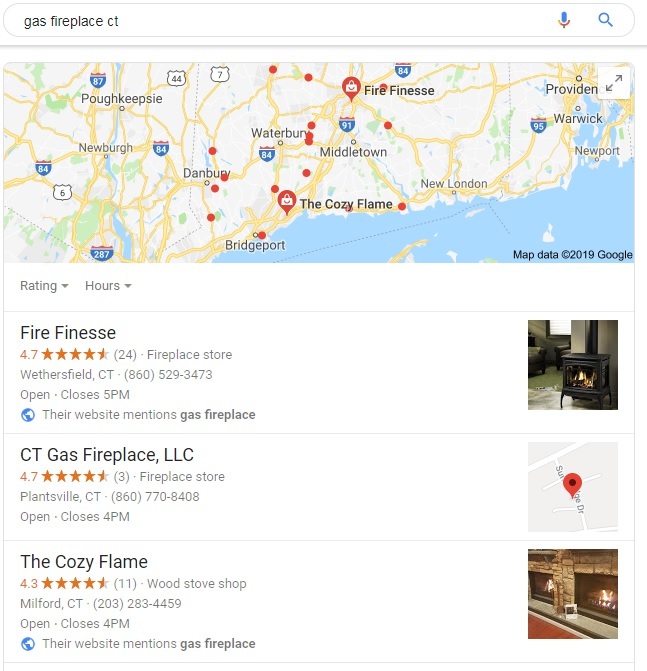 In a voice search the query is more specific, “Gas fireplace store in Connecticut” or something like that. Is there a difference? Let’s see. 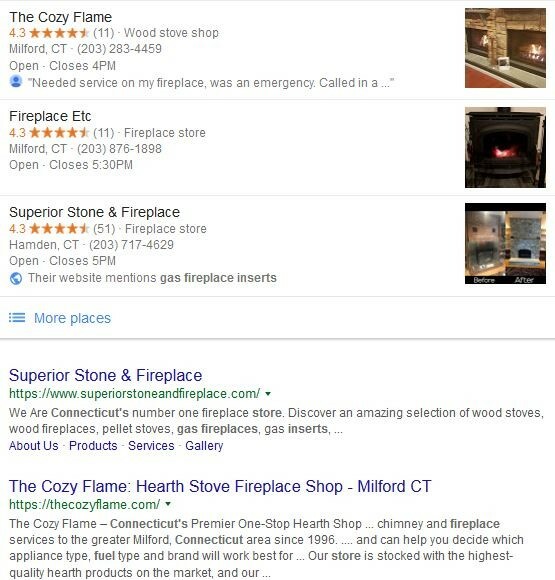 Keep in mind, my location is Milford, CT.
Now let’s look at the results for a voice search, “gas fireplace store in Connecticut.” Google spells out Connecticut in a voice search. Note the differences. In this search the first 2 locations are here in Milford and the third is in a town 18 miles away. Further, Superior Stone and Fireplace moved up from wherever they were in a typed query, they were fourth, to number 1 in the voice search. The addition of a single word made a big difference in the results. How to get ready for voice search and AEO? This goes back to good content. The more quality content you can to solve a problem, provide a service or sell a product the better able your company will be to answer specific voice queries. It’s no surprise that websites with a lot of content, 750 words or more a page are ranking higher in the SERPs these days. Learn to use featured snippets. Supplying information in a compelling way can land your content on the top of a search page via a featured snippet. You may not know what a featured snippet is but you’ve seen them. Google pulls the most relevant content and puts it in a box like this. You want to be the company that answers the question of “calories in chocolate cake” or a query about a product you offer. The better you’re able to educate your audience, the better result you will get. Use Schema to highlight your content. Schema is mark-up code you put on your website to help search engines show more detail and information. In the example above mark-up code was used by Superior Stone and Fireplace to highlight About Us, Products, Services and Gallery. Google is favoring its own information over what’s available on company websites. Your GMB page is the best way to get relevant information about your company to Google. Strangely, many companies haven’t even claimed there listing. Here you can add content and images, manage reviews and updates, make announcements, etc. For more information on how to get information about your business to Google, read our post on the subject. Is taking on an AEO project worth it? 65% of people 25-49 use their smart devices at least one day. 61% of them expect to use them more in the future. If you want to reach this important demographic in the future, you will have to invest in Answer Engine Optimization. You may be thinking “Well, I’m in the top 5 of search for most of my keywords. Why do I have to spend more now”? That’s probably what the owner of the now declining nutrition website thought 2 years ago. AEO is the future of online search and you have to move now or get left behind. If you have questions about AEO or SEO, contact us at 203-882-0171.